CLOTHES MANGLE.—Hamilton E. Smith, New York city.—This invention relates to a new clothes mangle, which is so arranged that a suitable degree of pressure can be brought to bear on the clothes or other articles that are wound upon a roller, and so that no pressure or power is uselessly ? expended on the roller that carries the clothes, and to obtain continuous ! action in one direction. MILK AND LIQUID COOLER.—A. P. Bussey.Westernville, ?. Y.—This invention relates to a new apparatus for cooling milk and other liquids, and is more particularly adapted to the use of dairymen for cooling the milk in the cans in which it is transferred, and for keeping it cool while being conveyed. \ MACHINERY FOR PROPELLING SMALL BOATS.—Virgil Dresser, Leavenworth, Kansas.—This invention relates to a new device for rotating by muscular-power paddle wheels that are;hung on flat boats or other small vessels, and consists in the application ot an oscillating lever which has a double set of pawls pivoted to it, to engage into ratchet wheels mounted on the paddle-wheel shaft. NOZZLE AND SCREW CAP.—Alexander N. Lapierre, New York city.—This invention relates to a new method of constructing the nozzles and caps of cans for returning oil and other liquid matter, and has for its object cheapness of arrangement and convenience of operation. The invention consists in providing a vent for the discharge and entry 'of atmospheric air, and in the arrangement of a washer, which is secured to the cap, and closes the vent and nozzle. HORSE-POWER FIRE ENGINE.—John C. McCarthy, New York city.—This invention relates to a new manner of constructing fire engines with a view of facilitating their operation where man or steam power cannot be readily obtained, The invention consists in the application of an endless apron, or other horse power, to a fire engine, so that horses on the engine.or near it may operate its pump'work for extinguishing fires. APPARATUS FOR DRYING LUMBER.—F. "I. Norton, Fremont, Ohio.—The object of this Invention is to construct a kilnf or drying lumber by means ot steam and dry heat produced by steam. The invention consists chiefly in arranging a series of doors within the kiln, which doors when let down will close one or more chambers, into which the steam is discharged, while they will, when swung up, open said chambes, so that the steam may freely enter the kiln. FREEZER.—Paul Schumacher, New York city.—This invention relates to a new apparatuswhich can be usedf orfreezing ice cream and other suitable substances. The object of the inventon is to obtain a proportionately large cooling surface to the quantity of the material to be cooled. SKIN AND OTHER GARMENTS OF CLOSE TEXTURE.—;H.E. Smith, New York city.—This invention consists in providing suchgarments withperf orations to permit the escape of the insensible ;perspirations and other emanations of the body, to maintain a more healthy condition thereof than can be done when these garments are worn in the common way. SURGICAL INSTRUMENT.—;P. J. Frank, Ashford, ?. Y.—The object of this invention is to provide a simple and efficient instrument for depositing medicine under the skin for the treatment of " hernia." COMPOUND WHEEL AND AXLE.—B. F.Leet, Dayton, Nevada.—This invention relates to new and useful improvements in wheels and axles for railroad cars, whereby it is designed to provide a simple and strong arrangement of independently revolving wheels, calculated also to utilize the wheels and axles now in use by removing one of the fixed wheels and substituting a loose wheel according to the improvement, which consists in the application to the common railroad car axle, having a selid collar i shrunk on at the center of wheels having hollow stems projecting from i the inner faces to the Baicl collars, and held in place by loose sleeves made I in two parts, having interval flanges which engage behind shoulders of projecting rims on the inner ends of the stems and hold them against the ends of the collars shrunk on the axles. WATER-WHEEL GOVERNOR.—J. A. Whitman, Auburn,Me.—Thisinvention consists of a combination with the driving mechanism for the governor, the gate operating devicea and the governor of a double-acting vibrating pawl, under an arrangement whereby it is changed to work the rachet I connected with the gate operating devices either way, the said pawl being ! worked by the direct action of the governor-drawing mechanism, thereby 1 relieving the governor of all labor except the changing of the 'pawl. The invention also comprises an improved construction of the governor where by the resistance of the air upon a pair of pendant-hinged revolving wings is made use of mainly for working a vertically sliding hub on a revolving spindle, to obtain the required reciprocating motion. , FIRKINS AND TUBS FOR BUTTER AND OTHER SUBSTANCES.—D.M.Lockridge, Atto,N.Y.—The object of this invention is to provide firkins, tubs.and other vesselsforpacking butter, lard, and other like matters, by which access may be had to the contents for inspection without the labor of loosening the hoops and removing the head,which allows the brine to run out, greatly to the disadvantage of the butter as to preservation. COMBINED SHOW CASE AND SAMPLE CARD FOR SPOOLED SILK, ETC.—Wm. G. Kelly, Oneida Community, Oneida, ?. Y.—This invention has for its object to furnish an improved showcase, which shall be so constructed and arranged as to hold the spools securely in place during transportation, exhibit them to good advantage to display the variety of colors,and at the same time allow the spools to be conveniently taken out. RAILROAD.—David Harrison, Fayette, Miss.—This invention has for its object to enable the cars to be run with safety at great speed, to give sure warning of their approach to a station, and to readily ascend steep grades, and which shall effect these objects in an easy, simple, and effective maDner. COPY HOLDER.— John S. Butler, Silver City, Idaho Ter.—This invention has for its object to furnish a simple and convenient copy holder, designed moreparticularly for compositors'use, which shall be so constru-cted and arranged that it may be placed between the upper and lower type cases, occupyinglittle space and without covering up any of the type boxes. MECHANICAL MOVEMENT.—D'Alembert T. Gale, Poughkeepsie, ?. Y.— This invention has for its object to furnish an improved mechanical movement for operating a ohurn, or driving light machiney, which shall be simple in construction, effective in operation, and convenient in use. CAR COUPLING.—Manuel Van Sly ke and D. W. Wood, Rome, ?. Y.—This invention has for its object to furnish a simple, convenient, safe, and reliable car coupling, which shall be so constructed and arranged that it will be self-coupling, and may be uncoupled from the side or top of the car without its being necessary to go between the cars for that purpose. TRUSS.—G.Mayer,Sullivan,111.—Thia invention relates to improvements in trusses, and has for its object to provide a simple, cheap,and efficient construction.and anadjustablearrangementfor the pads, to be either worn singly or double, and adapted for males or females. UNIVERSAL SHAFT COUPLING.—Wilfred P. Dugdale, Goshen, Ind.—Thisinvention relates to improvements inshaftcouplings, such as are used for coupling shafts when required to run out of a right line, and has for its ob-j ect to provide a coupling of simple and cheap construction, which may b e readily connected or disconnected, and having no projecting parts such as screw bolts, liable to catch into the clothing of attendants, and gather straws, etc., and designed more especially to be used with thrashing machines and applicable to other uses. SAP FEEDER.—Gee. D. Chandler, West Concord, Vt.—This invention consists in a float, having a stem hinged to the faucet, and so arranged that when the surface of the sap in the kettles, whereon the float rides, falls, it will open a passage irom the faucet allowing the sap to flow until it rises sufficiently to press the said stem, which is provided with $brk, or other suitable packing, against the mouth of the orifice with sufficient force to elose the passage. LEATHER PUNCHES.— John Lyle, Newark, N. J.—This invention relates i to improvements in hand-spring leather punches, having a number of punches of various sizes arranged on an adjustable hub, connected to one end of one of the j aws; and the invention consists in an improved arrangement of the hub, for connection with the said jaw, whereby it is held more securely in position against the tendency to turn when punching. CUT-OFF FOR PIPES.—James H.Perkins, Omaha, Neb.—This inventioncon-sists in the application to the conductors, where two sections are joined by , an oblique connection, the one sliding into the other and arranged to have an opening at one side of a hinged spout, so shaped and arranged that where the water is required to pass down to the cistern it may'be folded up against the side closing the lateral orifice, and when it is required to shut the water off and spout it through the lateral opening it may be readily turned down and arranged to cut off the direct passage below, and chute the water into other conductors, the eame hook holding it in either position. PACKING AND TRANSPORTING BUTTER.—J. Thayer, Palmyra, Wis.—This invention relates to a new and improved method of packing and transporting butter for sale and use. SPRING BED BOTTOM.—;F. F. Lahm, Chicago, 111.—This invention relates to a new and useful improvement in spring bottoms for beds and sleeping couches, and consists in the springs, and in the construction and arrangement of parts. CULTIVATOR.—W. T. Baker.Lancaster, Texas.—This invention relates to a new and useful improvement in machines for cultivating the ground, and it consists in the manner of hanging and regulating the cultivator plows. SPECTACLES.—Louis Black, Detroit, Mich.—This invention relates to a new and useful improvement in spectacles whereby the glasses, or either of them, may be readily removed and other glasses inserted. HOOP MACHINE.—William Lawyer, Macomb, ?. Y.—This invention re lates to a new and useful improvement in machines for facilitating the manufacture of hoops, having particular reference to the process called " rack ing." DRAFT REGULATOR.—J. J. Smith and Samuel Wood, Cleveland, Ohio.-This invention consists in the use of a column of mercury in an open tube which is subject to both steam and atmospheric pressure, in combination with suitable mechanism for operating upon draft dampers and also for acting upon the safety valve. HAY MAKING, LOADING, AND STACKING MACHINE.—;B. J. Moore, Dres-bach, Minn.—The object of this invention is to provide a simple, cheap, and effective maehine which may b e used for spreading hay, or raking, loading, or stacking it, and it consists in an improved arrangement of the truck for supporting and nfoving the several parts, and imparting the motion to an elevator ; also, in an arrangement for raising an endless elevator, employed for taking the hay from a rake and delivering it on a platform, when required to be out of action ; also, an improved construction and arrangement of the rake, for facilitating the independent action of the teeth, and the elevation of the rake above the working position. KNITTING MACHINE.—;H. C. Work, Philadelphia, Pa.—This invention consists of an improved method of taking the loops on the needles or hooks off,f or the reception of the new loops, and for discharging them over the said new loops by means of pins sliding up in grooves on the hooks just previous to the going down of the hooks with the new loops. The invention also comprises a means of operating both the hooks and the sliding pins by one cam on the cylinder, and it also consists of an improved arrangement of yarn guide in connection with the pawls for turning the cam. REFLECTOR.—Samuel Meadows, Toron to,Canada.—The object of this invention is to provide a glass reflector having the glasses so arranged as to have greater power than those now in use, and so that portions of the reflecting parts may be adjusted to throw the light on any given point, and also so arranged in respect of the frame for the support of the glass that the same may be easily and cheaply put together and parts removed for the substitution of other glasses when Droken. PROCESS FOR RESTORING AND PRESERVING BUTTER.—Calvin" Peck, Marshall, 111.—This invention and discovery relate to a new and useful improvement in a process for purifying and preserving butter, having especial reference to arresting fermentation, and restoring and preserving rancid butter. MACHINE FOR MAKING CHAIR SEATS.—Joseph C. McCormick, Smicks-burg,Va.—The object of this invention is to provide for public use a simple, convenient, and effective machine for cutting out and molding curved seats for common wooden chairs. PROCESS OF RESTORING;DECAYED RAILROAD TIES TO THEIR ORIGINAL DURABILITY.—Wm. Dripps, Coatesville, Pa.—It is the practice on railroads when making a general repair to take up all the ties though seven eighths of them may be good, provided they could be prevented from becoming any more decayed and unserviceable, to prevent decay and restore to such worthless ties an intrinsic value, and to prevent the loss of ties only partially deteriorated is the object of this invention. STOVES.—Asa Snyder, Richmond, Va.—This invention relates to stoves for heating or cooking purposes, having hollow-walled fire chambers, and hoilow grates, and perforations in the inner walls of the fire chambers for conducting air in a heated condition to the fire. SAFETY CAN.—;M. H. Barnes, Peoria, 111.—This invention has for its obj ect to prevent the access of flame to the explosive." vapor that always fills the empty portions of cans partially full of oil, so that the can may be safely used to supply lighted lamps, or brought into any proximity, however close, with flame, without danger of exploding. REMOVING DUST FROM THRASHING MACHINES.—Era Rose, Vernon, Ind —The object of this invention is to provide for use in connection with thrashingmachines.a simple, cheap, and convenient apparatus which c an be employed to take up and remove the dust from the.thrashing apparatus delivering it outside of the building in which the machine is used, or in any other convenient place. 1 CAR BRAKE.—;S. R. Stinard, Paterson, N. J.—This invention relates to im provements in the mode of operating brakes for retarding or stopping railroad cars or trains of cars, having particular reference to brakes which are made to act by means of steam, or compressed air, or other elastic fluid and which are under the control of the engineer, but at the same time not interfering with the operations of the hand brake of each car ; and the invention consists in applying mechanism for taking up, or com-pensatingf or the " slack," or play, between the cars of a train. FURNACE FOR MELTING AND IDECABONIZING IRON.—Charles Peters. Trenton, N. J.—This invention relates to a new and useful improvement in melting, decarbonizing, and desulphurizing iron, and consists in melting the iron at the top of the stack, or cupola, and dropping the uelted iron through a column of flame, and on to a solid cone, orbed, whereby the globules of iron are burst, and, in supplying oxygen, or atmospheric air to the iron on, or near, the cone or bed. STEAM ENGINES.—J. 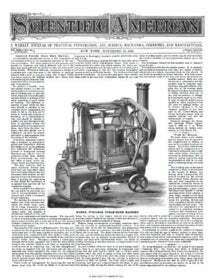 M. Davidson, Napoleon, Ark.—This invention relates to a new andusef ul improvement in steam engines, blowing cylinders and all other machinery where cylinders and pistons are used, and it con sists in so constructing the piston and] piston rod, and so connecting the rod with the cylinder head, that a pitman, or connecting rod,'and cross head is dispensed with. HEATER.—;H. Stickney, Cleveland, Ohio.—This invention relates to im provements in base*burning heaters, having for its object to provide cer-tain improvements in the construction and arrangement of the base and in the application of water vessels around the same ; also, an improved radia-tingapparatus ; also an improved valve arrangement in the magazine for preventing the escape of the gas therefrom, and for admitting the supply of coal ; also an improved means for operating the grate to discharge the ash and cinder; and also, an arrangement for closing the draft door by the action of the feed door in opening to prevent the escape of gas when supplying the magazine. COWLS FOR CHIMNEYS AND SHAFTS.—Edward Hewett, St. Leonard's-on-Sea, England.—This invention relates to improvements in the construction of cowls to be applied to chimneys andf urnaceshafts, whereby an efficient up draftis obtained and all down draft at the same time prevented. RIBBON CASE.—GeorgeF.Weolston.Marihalltown, Iowa.—The object of this invention is to provide a safe and convenient method of keeping ribbons for retail and for measuring the samelas they are sold, the arrangement being more especially designed for velvet and other expensive ribbops. PRESERVATION OF METALS.—A patent was recently granted to John Carson and Daniel Breed, of Washington city, for manufacturing, tempering, and preserving metals in a state of insulation from earth currents of electricity, in order to prevent crystallization, and to produce and retain the metal in a superior fibrous condition. In the practical application of the invention, it is necessary to insulate the foundation of the lurnace, the hammers, anvils, floors for the workmen, furnace tools, rollers, and machinery, molds, forges, and all appliances for working metals and tempering edge tools, store houses and racks where metals are kept, and every place and thing in contact or connection with the metal. Also, railroads, bridges, building, and other structures made of iron in whole or in part should be insulated. For the purpose of insulation glass tiles,balls,pillars, or any other suitable means may be employed. Upon railroads a board of gutta-pereha, or other bad conductor, may be placed between the ties and rails, and also under the chairs, or under the rails, upon the chairs, thus forming an insulating, elastic cushion for the rails, and thereby preventing the usually severe concussion of the rolling stock. The invevtion may be appliednot only to iron and steel, but also to copper, brass, and others metals and alloys where it is desirable to secure a highly fibrous condition, aiadprevent or retard crystallization. HATCHWAY GUARD.—Henry H. Covert, New York city, assignor to himself and James F. Sullivan,Brooklyn, N. T.—This invention relates to improvements in guards for hatchways in buildings, and has for its object to provide a removable safety guard, for the prevention of accidents to persons by inadvertently stepping over the edges of openings in the floors and falling through.